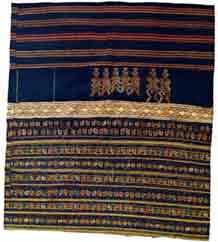 I collected my first Li textile - an intricately woven tiny tube skirt - in October 2001 never having previously been aware of the Li and their textiles. 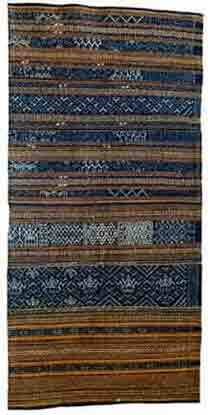 I was fascinated and in awe of the very complex weaving skills involved. 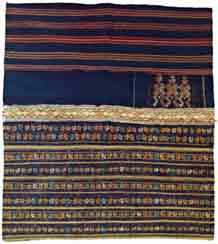 In early October 2002 Olivier Tallec posed his question on the tribaltextiles.info forum seeking information on Li textiles and I posted some details of a couple of the books now quoted in 'Li references'. 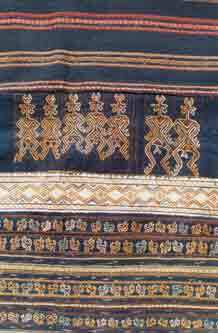 Later that month I added two more Li textiles to my own collection (a woman's blouse which is from the same Li sub-group as my first tube skirt - probably Ba-sa-dung Li) and a long tube skirt from another Li sub-group (possibly Meifu Li). In April 2003 I found some excellent photos at the http://www.ethnoecho.com/ethnic/clothings/liset.html web site of a tube skirt and blouse similar to my first Ba-sa-dung Li skirt and later blouse. This prompted me to post the ethnoecho.com link to the forum and to contact Olivier who then emailed me saying that he had a similar jacket and skirt (see detail from the jacket as the last photo below). 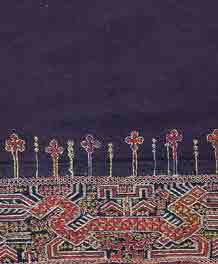 He said that he also had further, different Li textiles and emailed me with the photos below of textiles from what appear to be two further and different Li sub-groups. I believe these to be:- Meifu Li - the long tube skirt and Qi Li - the tube skirt with the very interesting figurative embroidery. 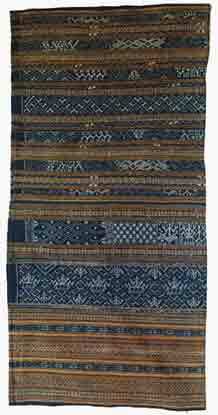 If you have further information on Li textiles or do not agree with my tentative identification please post your comments on the forum.